The “Mighty Ajax” was born of Italian descent as Joseph Milana on December 6 1884 in Washington DC. Sometime between 1900 and 1904, young Joseph started his career in entertainment as a pigeon trainer in “Dime Museums”, and ended his career in show business as a “Punch and Judy man”. 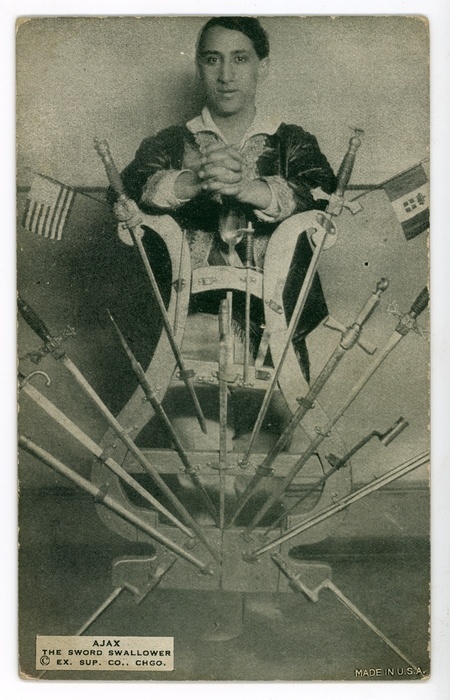 Ajax claimed to have taught himself sword swallowing, presumably around 1903-1904 at about the age of 17-18. Jospeh Milana is first listed as the sword swallower with the Miles Orton Big Southern Railroad Shows in the New York Clipper Directory of Show People published on March 5, 1904. (film c.1904-05) Later in 1904, the Mighty Ajax toured Europe with Buffalo Bill’s Wild West Show at the age of 18. When he performed his sword swallowing act, Ajax would stand on the bally, swallow a sword, and put it back in its scabbard. When audience members would claim, “Fake, fake!”, Ajax would offer them a challenge: “If anyone doubts that I’m really swallowing a sword, bring me your own sword, and I’ll swallow it, with the provision that if I swallow it, I get to keep it!” When Ajax performed for King George V of England, King George did not believe Ajax really swallowed the sword. So Ajax offered him his challenge. King George produced a sword, which Ajax carefully swallowed. As a result, the King was convinced, and Ajax was allowed to keep the King’s sword. From 1917 to 1922, Ajax lived in Brooklyn and worked at Dreamland Circus Side-Show in Coney Island NY. Ajax died in Brooklyn NY on April 27, 1959 at the age of 74 after performing over 54 years.